About eighteen months ago, we trained our first cohort of volunteer neutrals to co-mediate child protection cases in our newest court program. That training was the culmination of nearly two years of program development, in which we developed court rules and program procedures, and brought together stakeholders all in service of a shared vision to offer stability to vulnerable children. Since then, the program has assisted in over two dozen cases, providing a forum for over 150 family members, social workers, GALs and others to work out the roadblocks facing them. On September 29-30, we trained our second cohort. Though a smaller group than the original, we are astounded at the depth of experiences they bring to the Kane County, Illinois Child Protection Mediation Program. Their backgrounds include running law, mediation and coaching practices, as well as serving in the State’s Attorney’s office. Given these cases often come loaded with emotional firepower and complex interpersonal dynamics, it is a real boon to have such accomplished neutrals with a real diversity of experience. When we did our last training, I wrote up my takeaways, and thankfully, those lessons held up well! One other lesson we learned from surveys administered following the last training was that people left feeling apprehensive about how prepared they were to mediate these cases. Some part of that apprehension in unavoidable – we were asking our volunteers to step into a brand new program to mediate emotionally fraught, multi-party cases that few neutrals ever have the opportunity to mediate! To the extent we were able to, this time around, we as the trainers addressed that fear more directly: naming it, validating it, sharing stories about times we failed and how we rebounded. I think we in the ADR field have an archetype of the ideal neutral as someone who confidently controls the room and the process. There’s good reason to hold that standard up, but we also have to remember it takes time, experience and at least some failure to reach that level. If our most recent training reassured our mediators of that so they can more confidently go forward and serve these families, I’m content to call it a success. A huge thank you to our trainers Stephanie Senuta, Kevin Malone and Susan Yates. We are grateful to the Court Improvement Program and the Administrative Office of the Illinois Courts for providing the funding to put on this training*, and to the 16th Judicial Circuit Court of Kane County, Illinois and Flavors of North America International for furnishing the space for this training. *In September 2015, the Illinois Equal Justice Foundation awarded Resolution Systems Institute $40,000 to develop the pilot Child Protection Mediation Program in conjunction with the 16th Judicial Circuit Court of Illinois in Kane County. That funding was supplemented in July 2016, when the Illinois Bar Foundation awarded RSI $5,000 to support the program’s mediators. Most recently, for the 2018 fiscal year, RSI has been awarded $40,000 from the Administrative Office of the Illinois Courts’ State Court Improvement Program. Overall, $40,000 of the Kane County Child Protection Mediation Program’s. 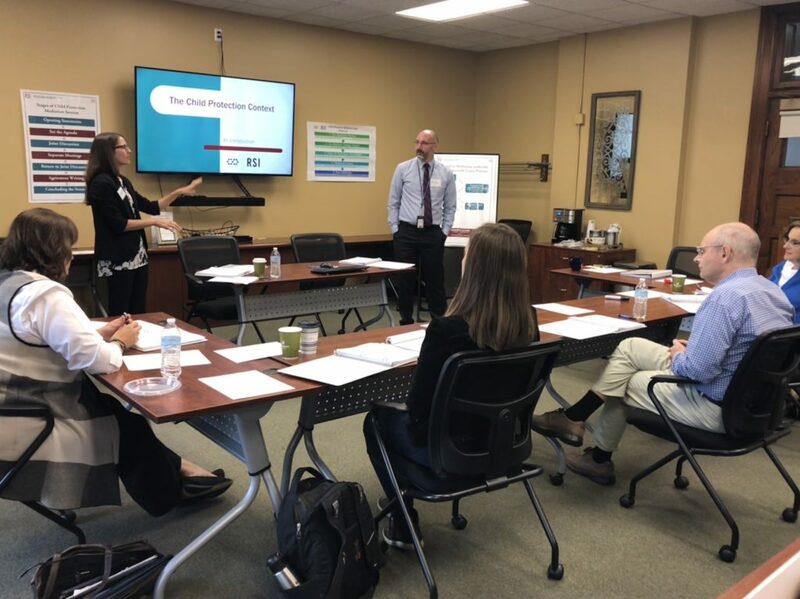 Trainer Stephanie Senuta and Kane County Mediation Programs Manager Kevin Malone leading a session during the September training. This entry was posted on Wednesday, October 31st, 2018 at 11:07 am	and is filed under Uncategorized. You can follow any responses to this entry through the RSS 2.0 feed. You can leave a response, or trackback from your own site. Great RSI training team! I am so proud of you guys!